Viscosity problems can completely derail a coating application. Inconsistent color, an imperfect finish, texture imperfections, the need for reworking or excessive addition solvent and pigment or dye can all be a result of the wrong viscosity. The viscosity of a fluid is a measure of its internal friction, the resistance to deformation by tensile stress or shear stress – what we might perceive as its thickness or resistance to flow. Simply put, viscometers measure a fluid’s flow resistance. There are a range of viscometer types and methods but ultimately they all define viscosity as a unit of measurement which can make sense of an important factor in coating application. In this article we look at viscometers, how they work, the variety of viscometer types, and where to find viscometer suppliers and instruments in the US. There are a number of factors that can affect the viscosity of a substance, and the types of fluid can also have different flow properties. Fluids are described as being either Newtonian or non-Newtonian. For Newtonian fluids, viscosity is a constant that depends on the temperature and pressure of the liquid. Non-Newtonian fluids do not follow this proportional relationship – as a non-Newtonian fluid is sheared, its viscosity decreases or increases. The type of viscosity exhibited by a paint or coating is important for how it is applied and used. Paint is a non-Newtonian fluid; its viscosity changes under the influence of force. Within that category there are four types: thixotropic, rheopectic, pseudoplastic, and dilatant. Thixotropic fluids are gel-like at rest but then become continually less viscous the longer they are agitated. Rheopectic fluids increase in viscosity the longer they are agitated. Pseudoplastic fluids experience shear thinning, where stress causes them to thin (like the spreading behavior of paint on a wall). Dilatant fluids experience shear thickening, where increased shear rate increases viscosity. It is hugely important for an effective coating application that the viscosity characteristics of the coating are taken into consideration. 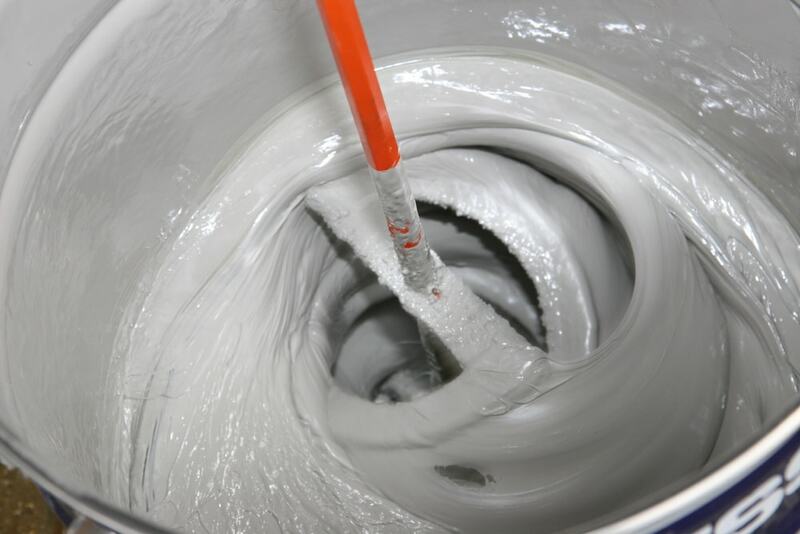 A coating’s viscosity directly relates to the concentration of solids in the fluid, the basis for the thickness and consistency of the final coating. Bubble viscometers – Measures the time it takes for an air bubble to rise through a fluid. The faster the bubble rises, the lower the viscosity. The resulting measure is in stokes – the unit of kinematic viscosity. Rotational viscometers – Measures how much torque is required to turn a disk or spindle in a fluid. They measure dynamic viscosity – a fluids internal resistance to flow under force. The viscometer spindle turns at a known speed in a known quantity of fluid. Orifice viscometers – These include the cup viscometers like flow cups (efflux cups) and dip cups. They usually consist of a cup with a hole through which the fluid flows. The time it takes for the fluid to empty from the cup is the measure of its viscosity. They include Zahn cups, Ford cups, ISO cups, and DIN cups. Vibrational viscometers – Measure the resistance of fluid to vibration. A resonator is immersed in a fluid, and the measure of its degree of damping from the fluid is determined to find its viscosity. Falling piston viscometers – Also known as the Norcross viscometer. This measures the force produced by a piston falling through a cylinder of a fluid to determine its viscosity. These are just five of the possible viscometer types. There are also capillary (U-tube) viscometers, falling ball viscometers, and rectangular-slit viscometers, just to name a few. If you would like advice about which type of viscometer is right for your application, our experts are here to help! Whether you need a rotational, orifice, or bubble viscometer, there is a company that can provide them. Companies that provide viscometers on the American market include BYK-Gardner, Elcometer, Rhopoint Instruments, and Cole-Palmer. Below we have provided a small selection of the viscometers available for the coating and paint industry. For more information about where to buy viscometers, get in touch! Use the “Request a Quote” button beneath this article and tell us about your business or project. We will collaborate with our coating partners to find the right product for your needs. Brookfield Cone Plate Wells Brookfield Viscometer The Wells-Brookfield Cone/Plate Viscometer gives researchers a sophisticated instrument for routinely determining absolute viscosity of fluids in small sample volumes. BYK-Gardner Byko-visc DS An easy to use digital Stormer viscometer that measures in KU (Krebs Units), Grams, and Centipoise units. Automatically controls and maintains the rotational speed at 200 rpms. Complies with ASTM method D 562. BYK-Gardner BYK Ford cup A flow cup that complies with ASTM methods D333, D365, D1200. Rhopoint Instruments Cone and Plate Viscometer The PAINTLAB+ Cone and Plate Viscometer provides high accuracy viscosity measurement of non-newtonian paints and coatings.